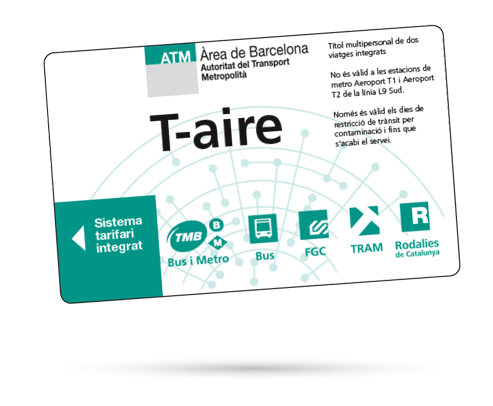 The multipersonal T-aire travel pass is for two trips for 1 to 6 zones. It is only on sale from the automatic machines at train stations on days with traffic restrictions due to high atmospheric contamination. It is not valid for the metro stations Aeroport T1 or Aeroport T2 on line L9 Sud. It is only valid on days with traffic restrictions due to high atmospheric contamination until the end of services. The price is the same as 2 trips with the T-10 travel pass, but with a 10% discount. 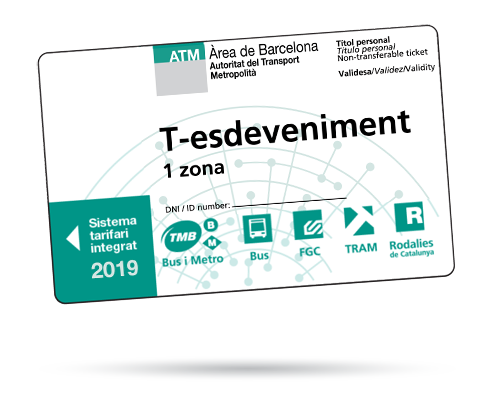 Personal and non-transferable time-based travel card allowing for 10 integrated journeys on all means of transport within the stipulated zones of travel (maximum payment covers 6 zones), with validity at the Aeroport T1 and Aeroport T2 metro stations on line L9 Sud. Must be accompanied by an official valid ID of the holder and mandatory certification of the holder's status as a worker at the Barcelona - El Prat Airport. The T-10 Treb. 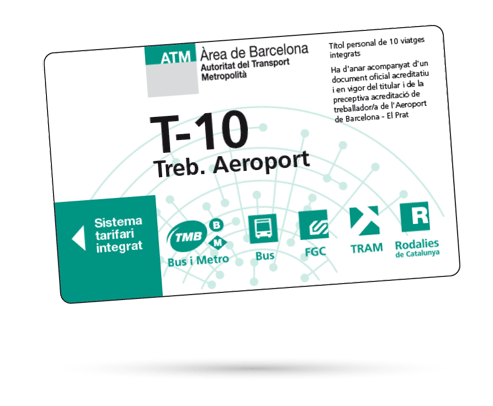 Aeroport travel card can only be purchased at the automatic vending machines in the halls of the Aeroport T1 and Aeroport T2 metro stations on line L9 Sud. Any person using the T-10 Treb. Aeroport travel card without the necessary accompanying certification (personal ID and Airport worker ID) or use by anyone other than the intended registered holder will be considered incorrect usage and will bring about the confiscation of the travel card by any employee of any of the different companies of the integrated public transport system, notwithstanding any other legal liabilities that may stem from such incorrect usage. The counties of Berguedà and Ripollès are now included in the integrated fare system as zone seven. Specific ticket for an event (congresses, trade fairs or sports events), personalised with the logo. Valid for 1 to 6 zones depending on the event's needs. The duration of the ticket depends on the event. Personalised, non-transferable ticket, with the identity card or passport number of the holder.